greenDAO is an object/relational mapping (ORM) tool for Android. It offers an object oriented interface to the relational database SQLite. ORM tools like greenDAO do many repetitive tasks for you and offer a simple interface to your data. Then model your entities and make your project, for example using Build > Make Project in Android Studio. Once you have defined at least one entity and built your project, you can start using greenDAO in your Android project. DaoMaster: The entry point for using greenDAO. DaoMaster holds the database object (SQLiteDatabase) and manages DAO classes (not objects) for a specific schema. It has static methods to create the tables or drop them. Its inner classes OpenHelper and DevOpenHelper are SQLiteOpenHelper implementations that create the schema in the SQLite database. 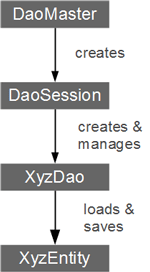 DaoSession: Manages all available DAO objects for a specific schema, which you can acquire using one of the getter methods. DaoSession provides also some generic persistence methods like insert, load, update, refresh and delete for entities. Lastly, a DaoSession objects also keeps track of an identity scope. For more details, have a look at the session documentation. DAOs: Data access objects (DAOs) persists and queries for entities. For each entity, greenDAO generates a DAO. It has more persistence methods than DaoSession, for example: count, loadAll, and insertInTx. Note: do not use DaoMaster.DevOpenHelper in production, it drops all tables on schema changes (in onUpgrade()). Create and use your own subclass of DaoMaster.OpenHelper instead. The example assumes a Note entity exists. With its DAO ( noteDao object), we can call the persistence operation for this specific entity.